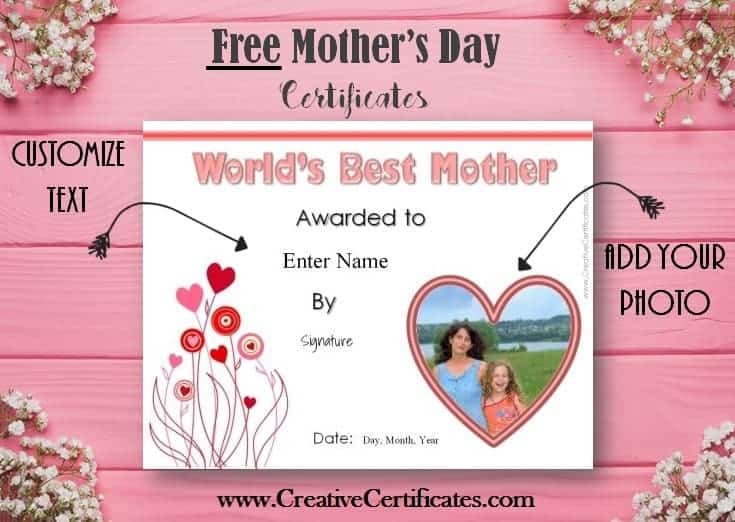 A selection of printable Mother’s Day certificate templates and cards to award mom for being so special. Some of the printable awards also have space for a photo of mom and the kid/s giving the award. You can either add the text in your own handwriting after you print the certificate or customize online. If you do customize online, the photo and text will be printed and the final product will be more professional. Both methods are free! Some of the templates have a frame to insert a photo. Click on the frame to insert the photo. Sometimes, the inserted photo does not cover the frame or the section of the photo that you want to appear does not fit perfectly where you want it. Move the photo around until you are satisfied with the position before you print. To enlarge the photo, click on the arrow on the bottom right corner and drag it to the right. To make it smaller drag it to the left. Even if you selected a template without a photo you can still add one. To add a photo click on the photo icon. Move the photo to the desired position. You can print the award certificates on paper or cardstock. If you want to add a special touch you can roll it up and tie it with a pretty ribbon. Tip: You might also want to create a gift certificate template for mom.